Shakin & Bakin Foodie Blog: Review and Giveaway | Robert Rothschild Pineapple-Habanero Dip Giveaway! Review and Giveaway | Robert Rothschild Pineapple-Habanero Dip Giveaway! Today I would like to introduce you to the company called Robert Rothschild Farm who makes some of the most delicious gourmet food products I have ever tasted. For the past 8 years or so...I have been a HUGE fan of their raspberry honey mustard pretzel dip and you can always find a jar of that here in my home. I was really excited to be contacted by them to do a review for all of you on the Robert Rothchild Roasted Pineapple & Habanero Dip. The Roasted Pineapple & Habanero Dip can be used in many ways. It can be used as a snack dip straight from the jar or mix it with a block of softened cream cheese for a creamy-style dip. This dip can also be used as a marinade for meat, fish and poultry and for the review...we decided to use our jar to marinate some pork chops. They included the Pineapple Habanero Pork Chops recipe in with my package and that is what we used. The recipe was easy to prepare and instead of grilling our pork chops, we baked them since it was raining outside. We used the entire 14 ounce jar to marinade our pork chops for 8 hours before we baked them and they came out just perfectly! I was a little worried that they would be too spicy for me to eat since I have gastric problems but I was pleasantly surprised that I could eat them and they were absolutely delicious. The combination of the "sweet" pineapples tasted fabulous with the "spicy" taste of the habanero peppers. The pork chops were nice and moist and they had a wonderful flavor to them...matter of fact...I have never tasted anything like this so it was fabulous. My husband raved and raved over these pork chops and actually ate 2 large pork chops that night for dinner. The next day...he had the leftovers too! 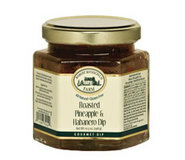 We give this Roasted Pineapple-Habanero Dip a huge two thumbs up! Next time we are going to try it out by marinating some chicken in it and then throwing those chicken pieces onto our grill. I bet they are going to taste fantastic! We invite you to check out all of the wonderful gourmet food products that Robert Rothschild has to offer and trust me...they offer a lot! When you go over to their web site...make sure you check out their fantastic recipes while you are there. I love Artichoke dip and this one sounds fab! I have tried many of their products before but never their hummus. I love hummus and I'm sure theirs is great! I'd like to try the Roasted Garlic & Fig Spread. I'd like to try the Pretzel Dippers. I entered the Manna Bread giveaway. I would love to try the Tequila Lime Salsa! I entered the Ancient Stones Mineral Makeup giveaway on Two Classy Chics Blog. I would like the tarragon peppercorn mustard. I would like to try the Seedless Red Raspberry Preserves. I've entered into the Umbrellas by Ella Umbrella giveaway over at TCC.